» Articles » Sharp Tips » Do I Need To Stake My Lilies? Do I Need To Stake My Lilies? Generally--no. The Asiatic lilies have sufficient stability and strength within their stems to support their own weight throughout the growing season. Problems may arise, however, if lilies are planted in areas of too much shade, as these plants require full sun for maximum vigor and healthy growth. 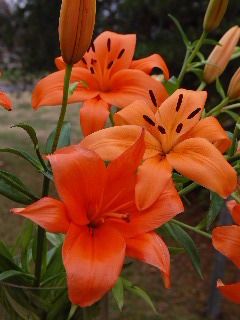 If the lilies are shaded, the stems will become spindly, weak, and overly tall as they reach upward for adequate sunlight. This will cause them to fall over in the summer breezes, as they will be too weak to support their own weight. It’s not unusual for the lily stalks to reach 3, 4, (or more) feet in height. If you notice your lilies spiking upward too quickly before bloom buds start to open, and they’re not receiving full sun, you might as well go ahead and stake them--as they’ll probably start to fall over as the heavy blooms appear. And, if this is the case, take note of the areas of your flower garden that do receive full sunlight throughout the days as the summer progresses. Then use this information to move your bulbs, after they go into fall dormancy, into these areas of full sun. Or, better still, plant new bulbs into these sunny areas. Give your lily bulbs (and other flower bulbs) a good feeding of bulb food, and cover up their beds with a generous layer of mulch to get them through the late fall and winter and into the next growing season. Healthy, well-fed lilies, planted into rich organic soil, and situated in an area that receives full sunlight, should not need to be staked.